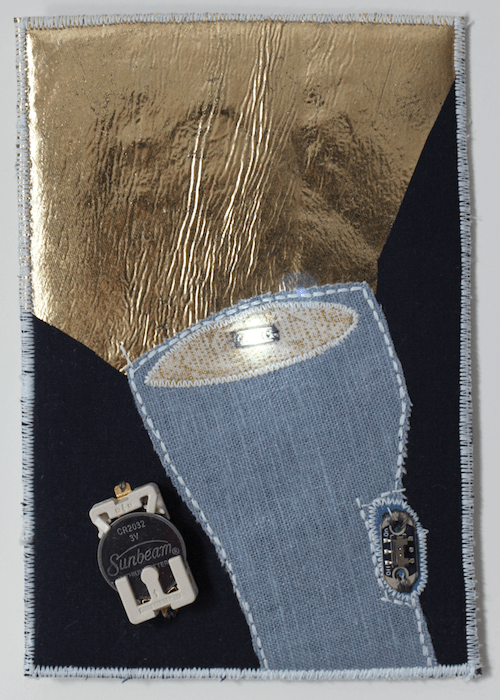 I have been experimenting with adding LED lights to make fabric postcards. 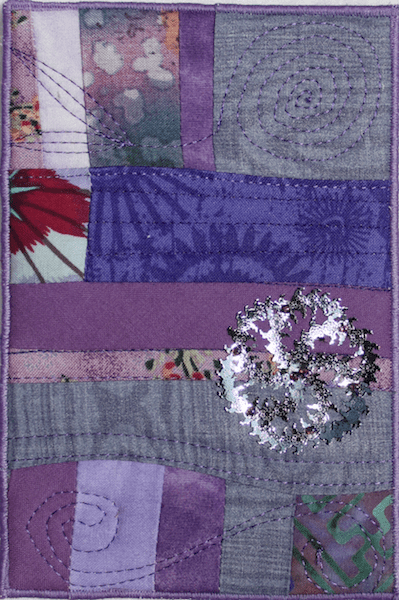 Each postcard is constructed like a mini quilt, but, with the addition of some fun sparkle! 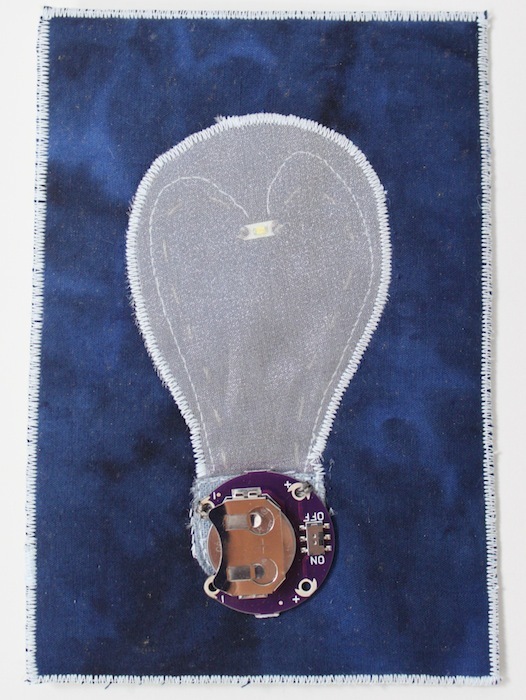 Conductive thread connects the LIlyPad coin cell battery holder that has an on/off switch to the LED light. It is the most simple circuit to create. NiteLite Glow in the Dark Thread is used for all of the other stitching. 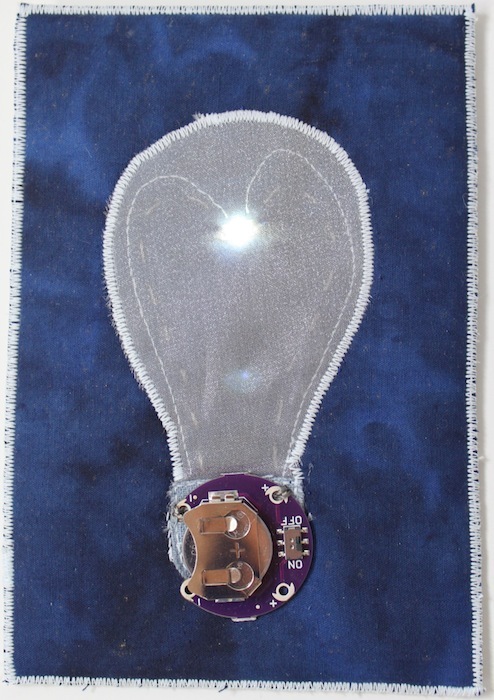 The flashlight postcard is a slightly more complex circuit. The sewable battery holder does not have an on/off switch, so I added a separate LilyPad Slide Switch to the circuit. This way you don’t need to continually remove the coin cell battery when you don’t want power to your LEDs. The firefly postcards was so much fun! 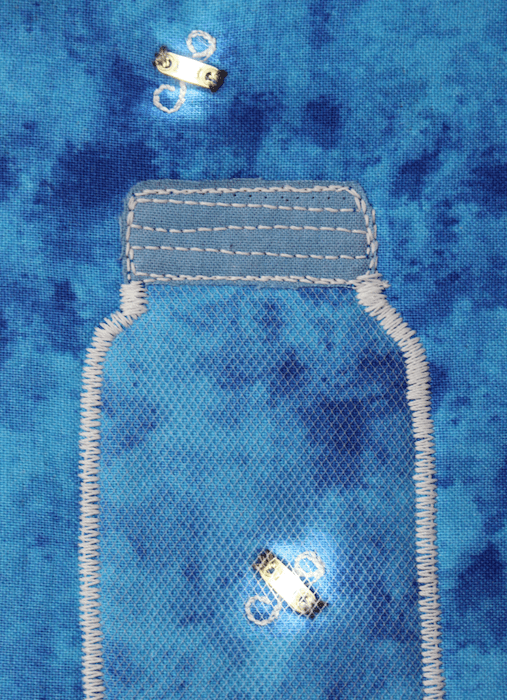 One of the tiny fireflies is captured in the mason jar, but one has managed to escape! The two LED lights are connected in a series and I’ve hidden the LilyPad coin cell battery holder in the corner. Which one is your favourite postcard? A margarita to celebrate the New Year – 2016! 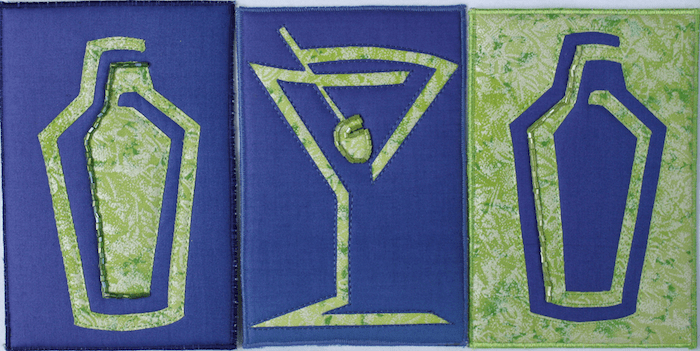 Here are a selection of appliqued margarita glasses to help you celebrate the coming of the New Year! 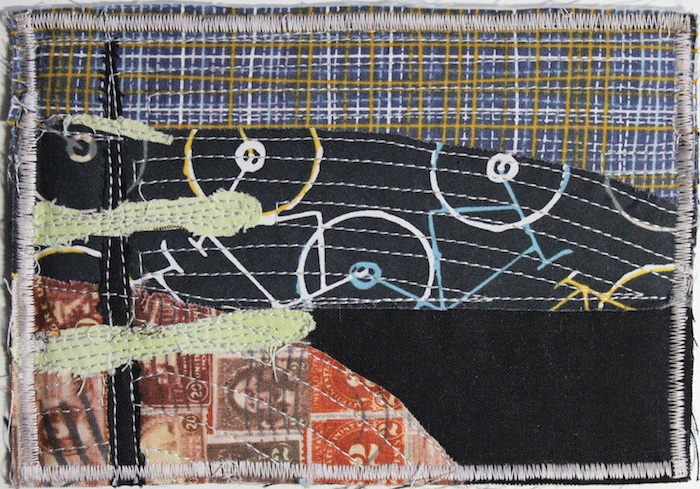 These quilted art postcards are carefully cut out of hand dyed fabric to create a positive and negative design. The negative design is layered over a rectangle of cotton, machine stitched and then hand beaded with beautiful glass beads. 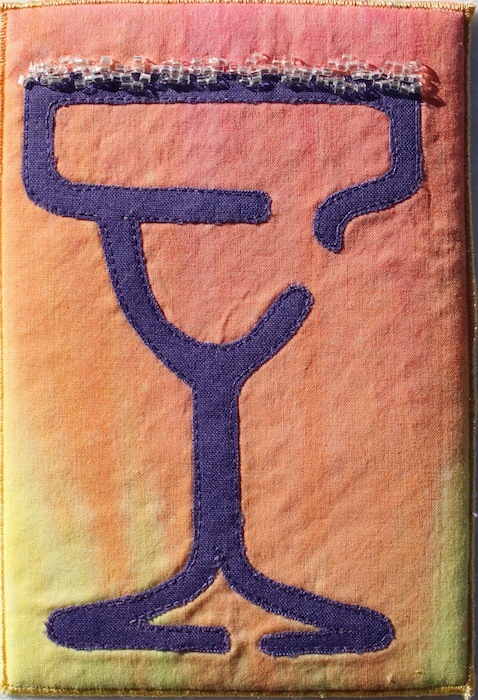 The positive margarita glass is layered on top of a hand dyed piece and stitched. Beautiful glass beads are then hand stitched along the rim to represent salt. Hoping you raise a glass of cheer with your favourite people! 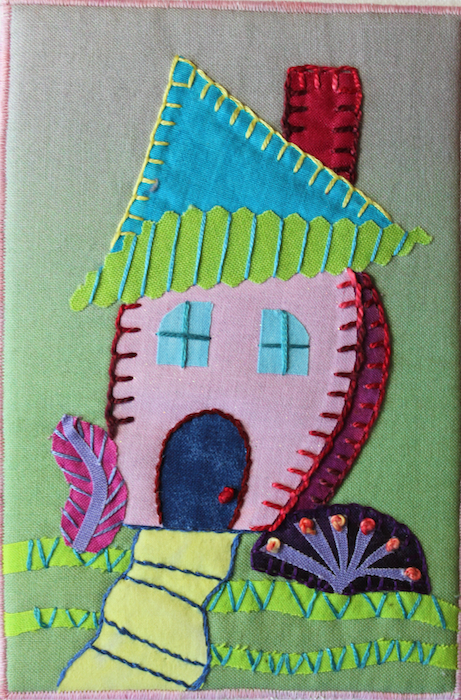 I’ve been creating more quilted art postcards with tiny, quirky houses. Each home has it’s own unique personality. I especially like the woven roof of the postcard above. 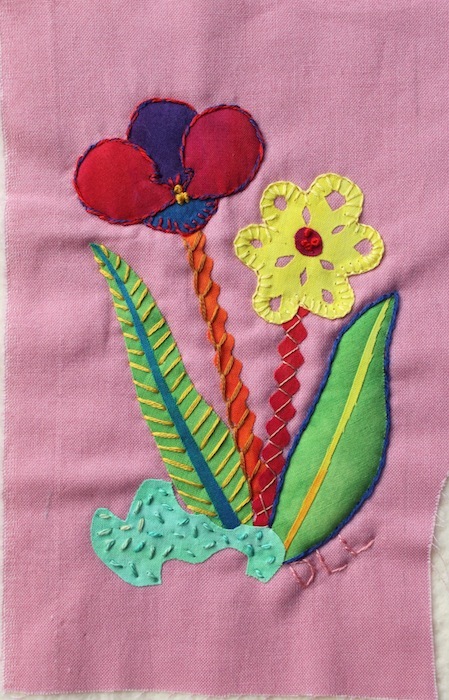 The embroidered flowers were begun one day when my niece was visiting. 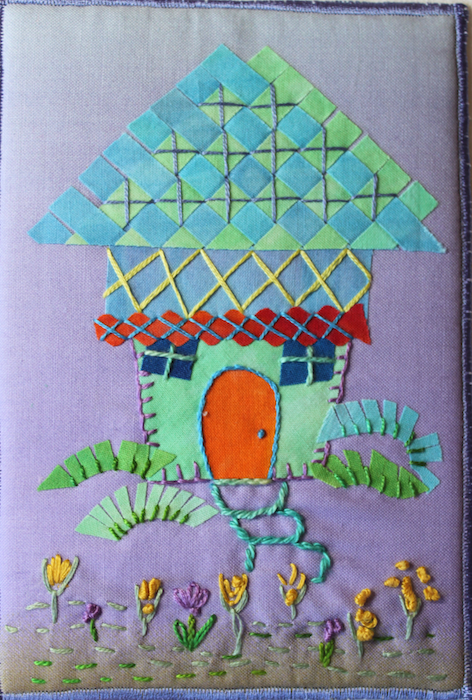 She showed me how to embroider – she had just been taught at her school! 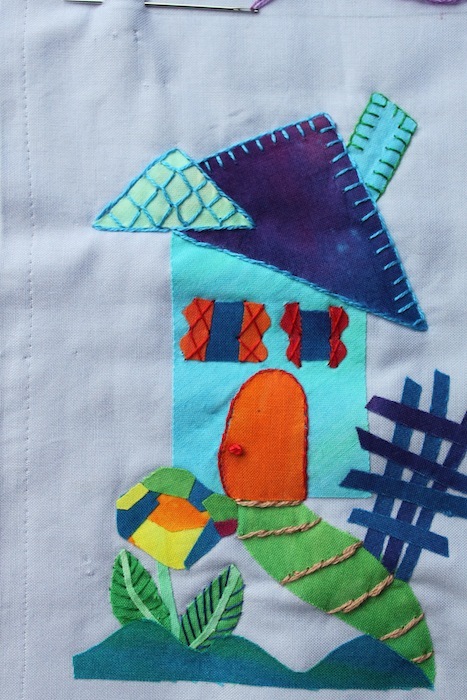 The houses are fused using hand dyed and commercial cottons. I’ve used some of the techniques taught by Laura Wasilowski. 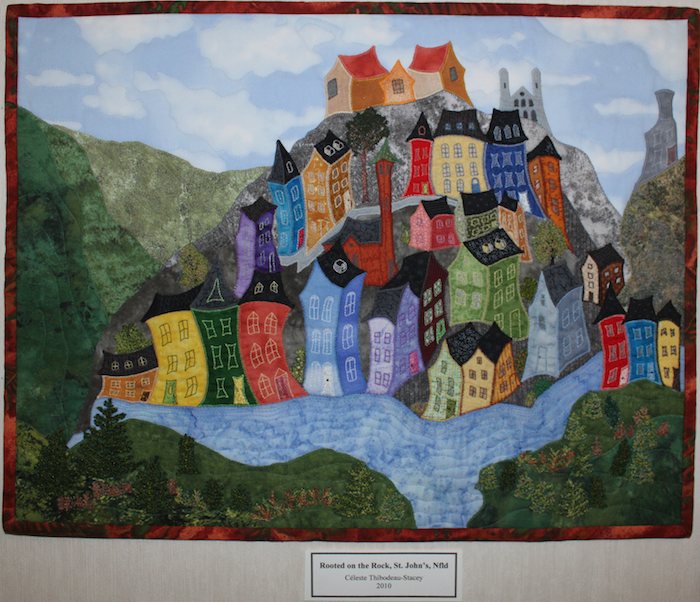 I was also influenced by some quilts I saw this summer at the Paradise District Quilters’ 30th Anniversary Exhibit. One of the members is Celeste Thibodeau-Stacey from Paradise, Nova Scotia. Her work was cheerful, happy and quirky. 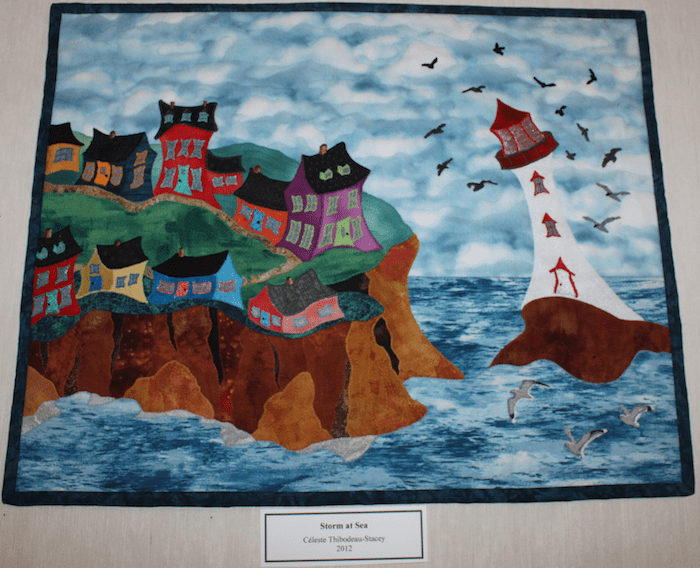 This piece is a town in Newfoundland, hugging the “rock”. The lighthouse is bending with the prevailing wind and the houses too seem to have been sculpted into shape by the winds! Hand dyed perle cotton in a couple of different weights have been used to add fun details. This house has settled down for the evening. TMQG Postcard Swap – postcards received! During the summer, the Presidents of the Toronto Modern Quilt Guild organized a postcard swap. I created three postcards and blogged about the process for each one. A very heartfelt thanks to Lynda for both postcards. They were fused and raw edge appliquéd. I love the postage stamp fabric! 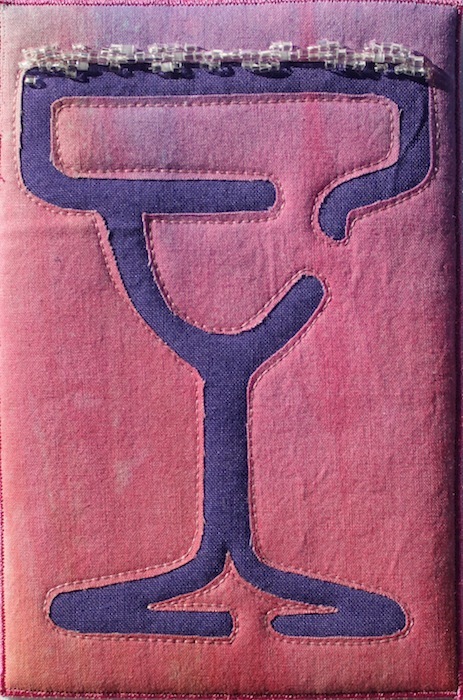 Karen’s card was also fused and raw edge appliquéd. The feature of the postcard was the beautiful centre with strands of embroidery floss capturing a few beads in shades of orange. 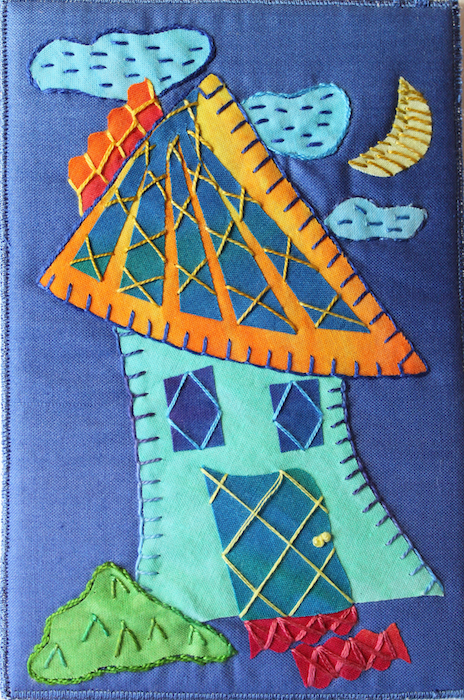 As a bonus, Catherine sent this lovely crazy patch design featuring embroidery stitches from her sewing machine. At the September meeting, we got to see more of the postcards and they were all unique. I think it’s a great way to try new techniques without risk. 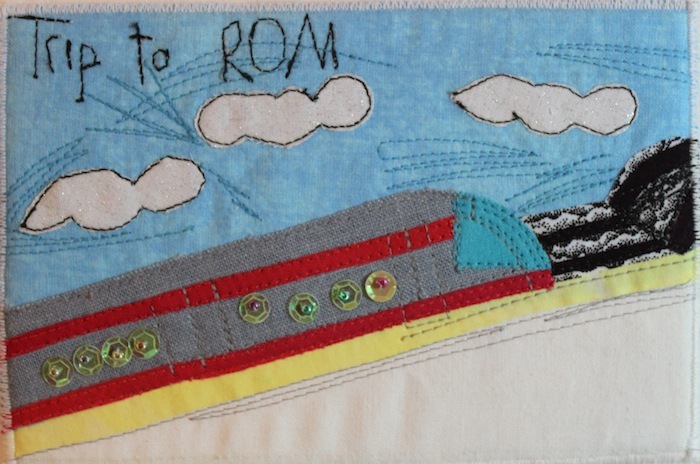 This is the last postcard I created for the Toronto Modern Quilt Guild swap. With this postcard I tried a technique that was new to me – trapunto. 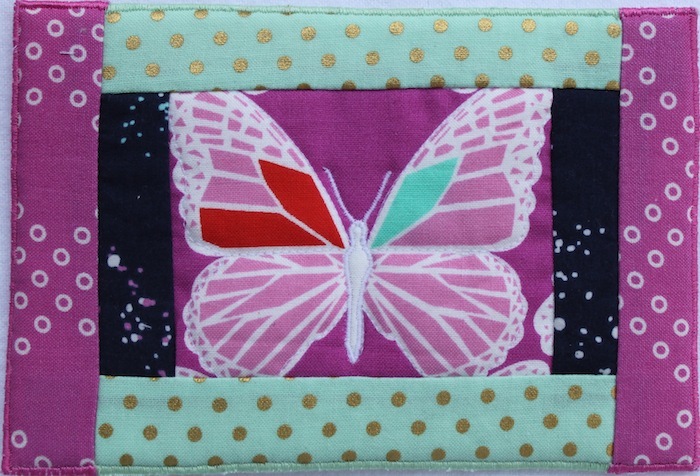 I added a layer of quilt batting behind the butterfly, stitched around the outline and cut away the excess batting. This was then layered over a 5″ x 7″ piece of batting and backing. 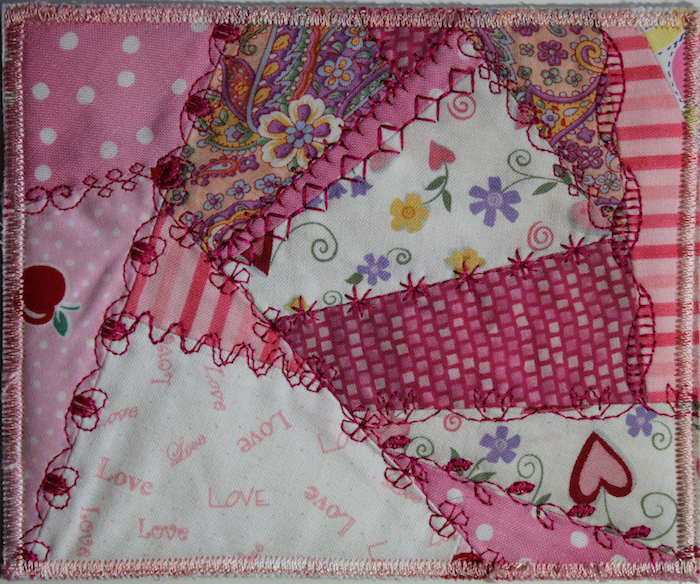 The strips were added in a quilt as you go style through the batting and backing. 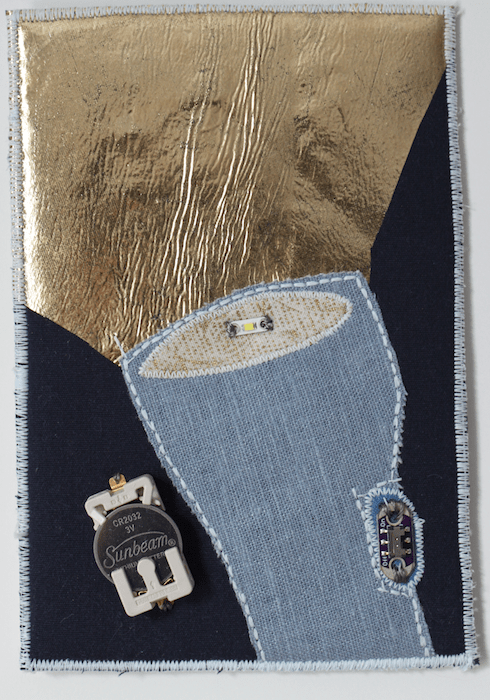 All the fabrics used in this postcard are from Cotton + Steel. This year at QuiltCon, Cotton + Steel had a large display booth with all of their fabric lines on display. They also had sewing stations set up for quilters to make and take a small project using their fabrics. The last day of the conference, attendees were allowed to go through the scraps and fill a bag to take home with them. The recipient of this postcard and I were one of those waiting for the conference to officially close so we could fill our bag. 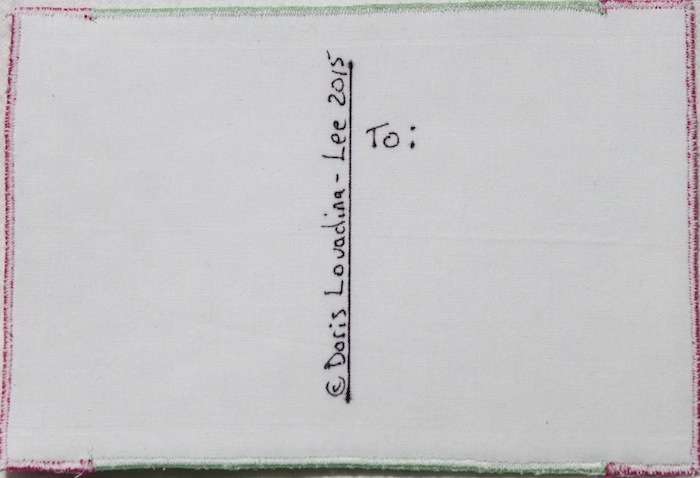 The back of the postcard is a solid white cotton that is fused to a heavy weight fusible interfacing. I used an ultra fine permanent ink marker to add the information. Postage is the same as it would be for any postcard mailed in Canada. Have you received any unusual postcards? The presidents of the Toronto Modern Quilt Guild suggested we do a fun min-activity since the guild doesn’t meet during July and August. I signed up to make three postcards and will receive three back. The second postcard I created for the Toronto Modern Quilt Guild swap also used the hand dyed fabric scraps from Laura Wasilowski of Artfabrik. This tiny house emerged from the scraps with a trellis waiting for flowers. 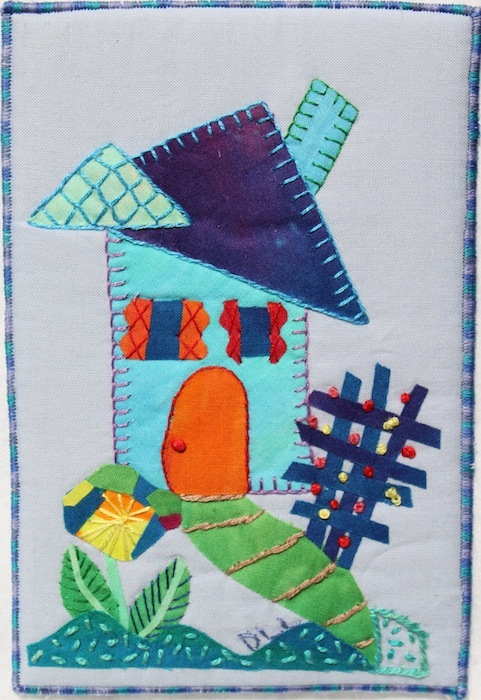 Embroidery floss and hand dyed perle cotton stitches are added to bring out the personality of the house. 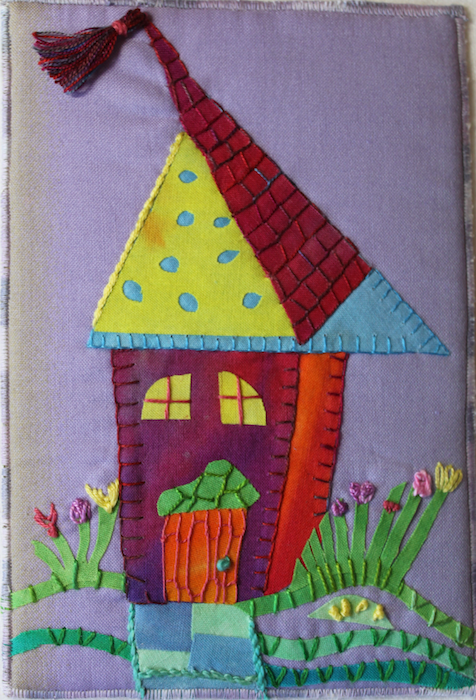 The finished pieces is layered with a stiff fusible interfacing and finished with a satin stitch around the edges in a variegated thread. The Toronto Modern Quilt Guild doesn’t meet during the summer months, but to keep us active our Presidents have organized a Postcard Swap. Interested members of the guild have signed up to make and receive up to three postcards. This is a casual no stress activity with no themes or restrictions, we could do whatever made us happy. I signed up to make three postcards and will receive three in return. The postcards only need to be received before August 31st and the participants are asked to bring in the postcards they will receive to the meeting in September. 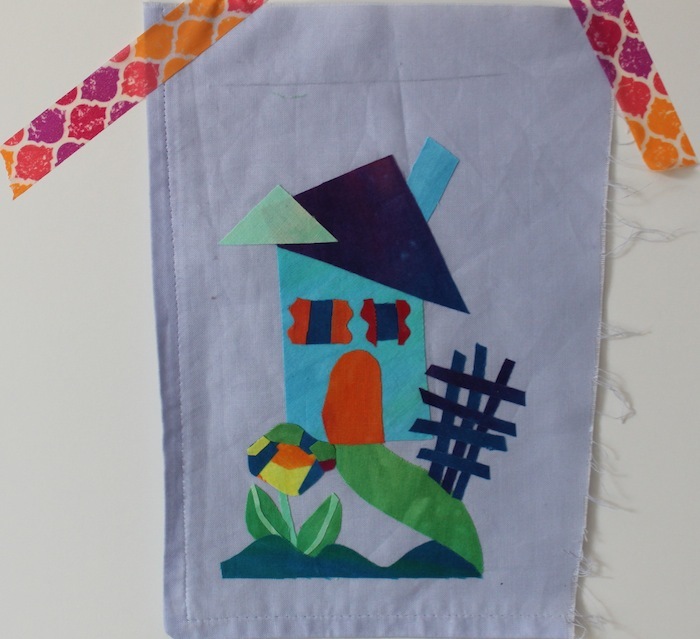 I decided to use some of the beautiful hand dyed fabric left from the Tiny Homes – Fusing Workshop I took with Laura Wasilowski of Artfabrik. I haven’t yet finished the piece I started during this workshop and have small pieces of scraps fused and ready to use. 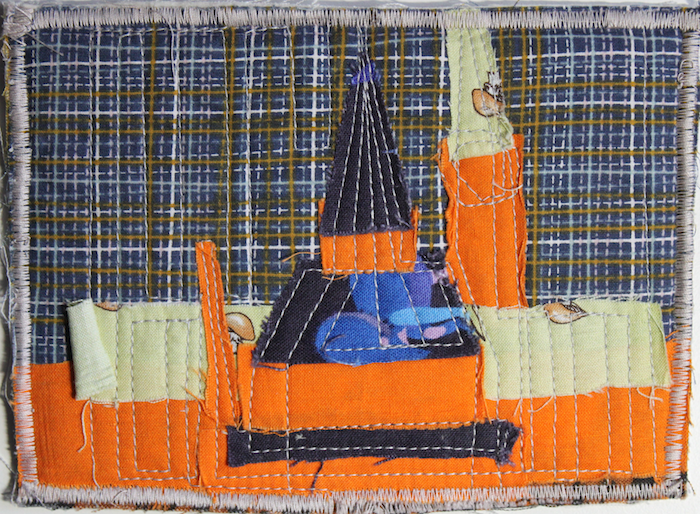 Once the pieces were fused, I began to add detail with embroidery. I enjoyed this part of the process much more than I expected to. I used embroidery floss and perle cotton, including some I hand dyed! 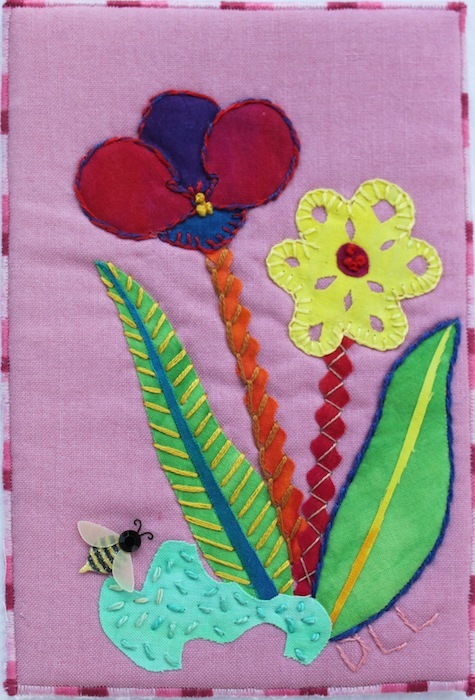 To finish this little flower garden, I embroidered my initials, added a tiny bumble bee and satin stitched the edges with a variegated thread. I will be posting photos of the other two postcards I made for the swap in the next couple of weeks. Stay tuned! It’s the end of the school year and there is always a scramble to find the perfect gift to give your child’s teacher. 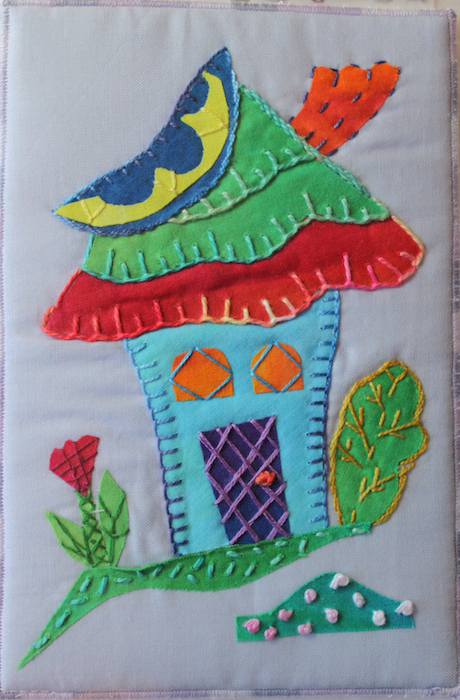 Since my son began attending school, we have been creating personalized quilted art postcards to give as gifts. Each postcard is 4″ x 6″, the perfect size for a small piece of art that is easy to display. I asked my son to draw a picture that reflected something memorable from his school year. 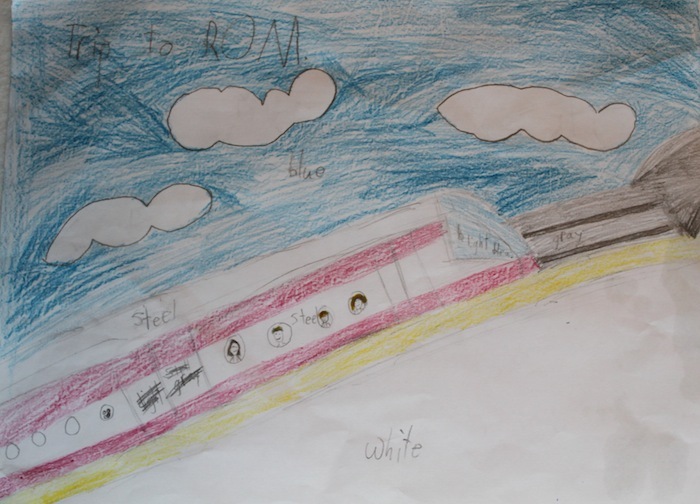 This year he drew a picture of the class trip to the ROM (Royal Ontario Museum). They travelled by subway to spend the day visiting the exhibits. The drawing was coloured (with helpful suggestions for me!) on a blank sheet of paper. 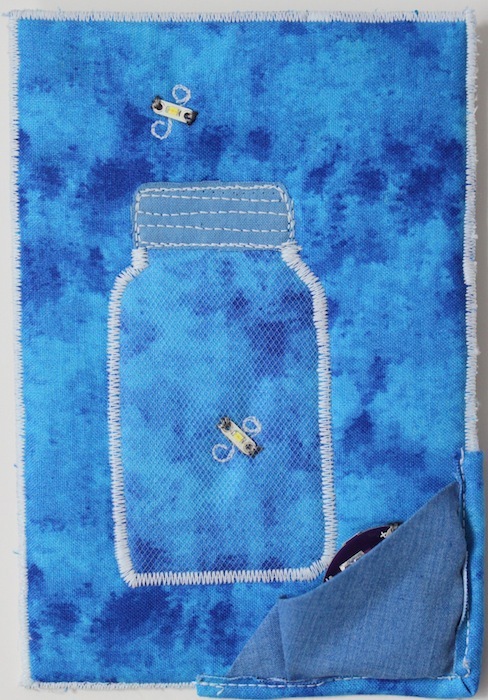 I translated his sketch into the postcard above by fusing fabrics, machine stitching and adding the details with beads. In this piece, I asked him about using sequins and beads to represent the faces he drew in the window. With his approval, I used pink beads for the two females and blue for the two males. You can see another one of his drawings that was made into a postcard in this earlier post: Quilted Art Postcards. He enjoys drawing and colouring and I enjoy the quilting! It’s a great collaboration. 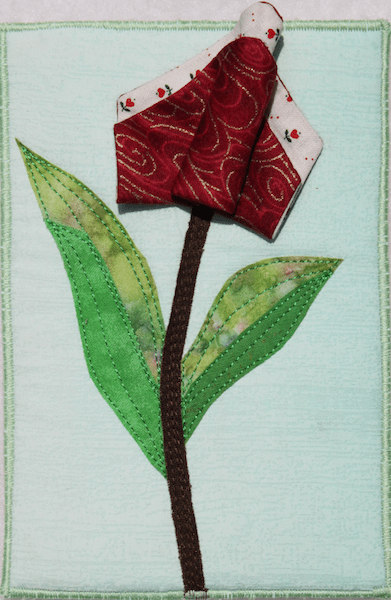 If you are interested in making a no-sew postcard, check out Barb’s interview with me at ritewhileucan. 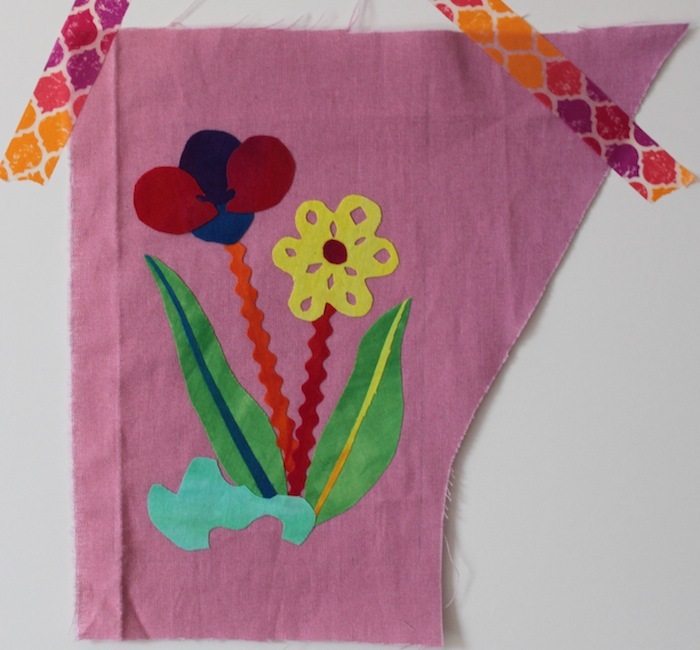 I describe how to create a beautiful art project out of fabric scraps and card stock. Have a look and create a beautiful personalized gift for someone special. I just finished these three postcards. They had been partially constructed for a class I taught for the Upper Grand District School Board Continuing Education Department. This flower was created from a hexagon. The hexagon was folded in half so that a little of the lining shows. 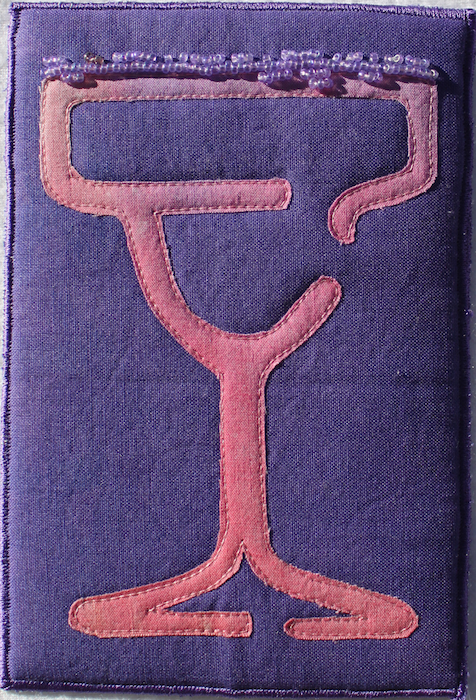 It was then folded in half width wise and a tuck was stitched to create its shape. 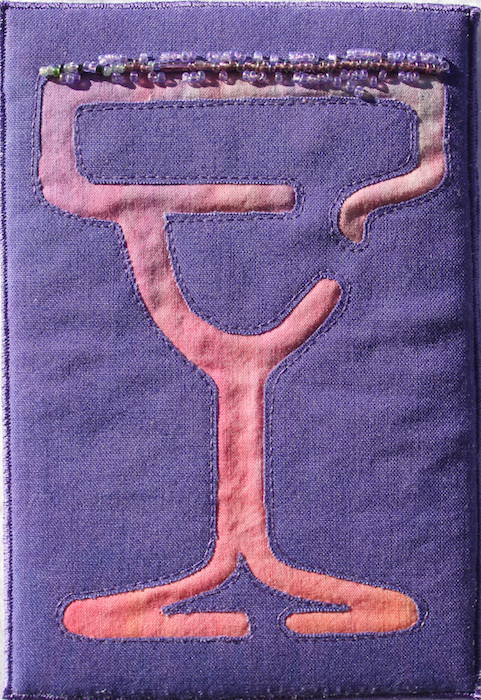 The leaves and stem are fused and stitched to add dimension. I love the colour purple! I improvisationally pieced a few small pieces to create the background. 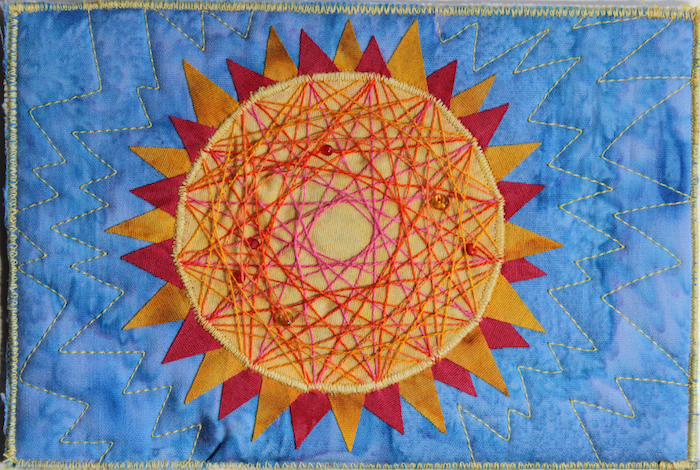 Some free motion quilting and a silver foil piece with beads adds interest. 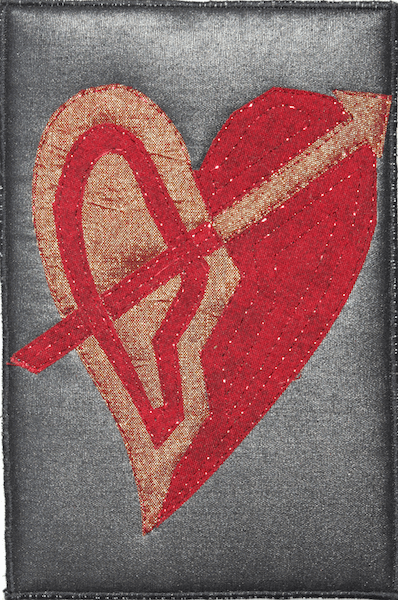 This broken heart is made with a red and gold lame fabric and a red cotton. It’s fused and free motion quilted onto a black cotton sateen with a metallic thread. I love making these miniature quilts. They are quick to make and are a great way to try out new techniques.